The metropolitan college basketball winning streaks were extended at the expense of invaders from western Pennsylvania and the South last night at Madison Square Garden. Long Island University's unbeaten Blue Devils came up from behind with a frenzied rally that toppled Duquesne from the ranks of the undefeated, 36 to 34 and spotless New York university ran away from Kentucky late in the game for a 41-28 triumph that was its ninth this season and the seventeenth since its last reverse. Long Island's last-ditch surge engineered on spectacular baskets by Jules Bender and Marius Russo, gave the team from Brooklyn its twelfth victory of the current campaign and the nineteenth since Duquesne bowled it over on the same court less than a year ago. For the third time this season the Garden was sold out for an intercollegiate dribbling duel. The attendance was 18,010. 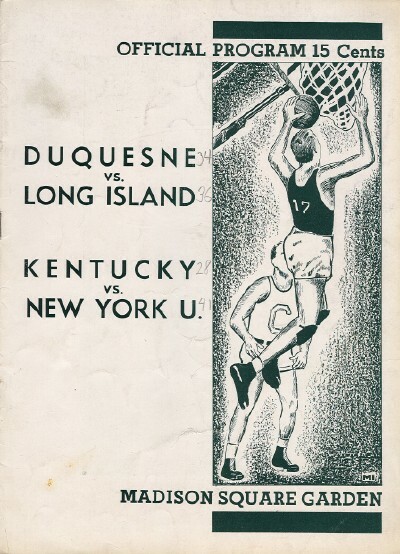 New York University, which makes a habit of bumping off champions of basketball strongholds in the hinterlands had too much poise and finesse for the Kentuckians who held them to a one-point margin in their controversial meeting of last year. The virulent Violets assumed the lead midway through a slow first half, suffered the Wildcats to come within one and two points of them in the second period and then romped away with a dazzling exhibition of passing, cutting and shooting that left the Southerners on the freight track. All eight of the player used by N.Y.U. figured in the scoring, so well balanced is the Violet squad, and it was this distribution of strength that overwhelmed Kentucky. The Lexington team, with a deliberate attack built on set plays superimposed on pivot set up just outside the foul line, depended for its points on two tall lads who could throw them off either hand. Ralph Carlisle, sophomore forward, gave the most brilliant exhibition of shooting seen in the Garden this season. Pitching from the corners and in front of the ring, he caged seven field goals and three foul baskets for seventeen points. Furthermore, he limited his personal adversary, Len Maidman, to eight points. The game was open and for the most part well played, although by no means as interesting and exciting to watch as the spine-tingling struggle between L.I.U. and Duquesne. Both N.Y.U. and Kentucky lost a man on too frequent infractions of the foul rule. 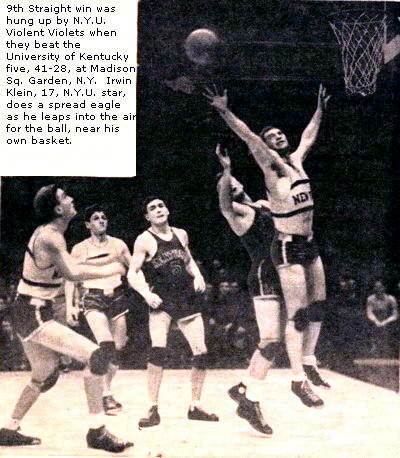 The Violet lost its captain, Willie Rubenstein, with less than a minute to play, and Kentucky had to bench Warfield Donohue, a slick guard. Donohue was the victim of circumstances and a scorer's error. One of the fouls charged against him was made by his teammate, Milerd Anderson, who should have been out of the game instead. N.Y.U. built up a 17-12 lead over Kentucky in the second quarter of the contest, but twice in the closing half was threatened by the spectacular shooting of Lewis and Carlisle. With twelve minutes of the last period gone, two successive goals by Carlisle reduced the Violets' lead to 23-22. Half a minute later is was 25-23, and with five minutes to go New York University was ahead 29 to 25. Then the bottom dropped out of Kentucky's game. N.Y.U. put on the pressure and in the remaining time went through around and over the befuddled Southerners for a string of 12 points, interrupted only by two Kentucky foul throws. The outstanding player in this N.Y.U. spurt was Irwin Witty, the only sophomore on the first string. he scored two foul goals and three gorgeous field baskets at the most opportune moments and fed the ball up the backboard for Rubinstein and Schulman to pop in for points that locked the door in Kentucky's face. 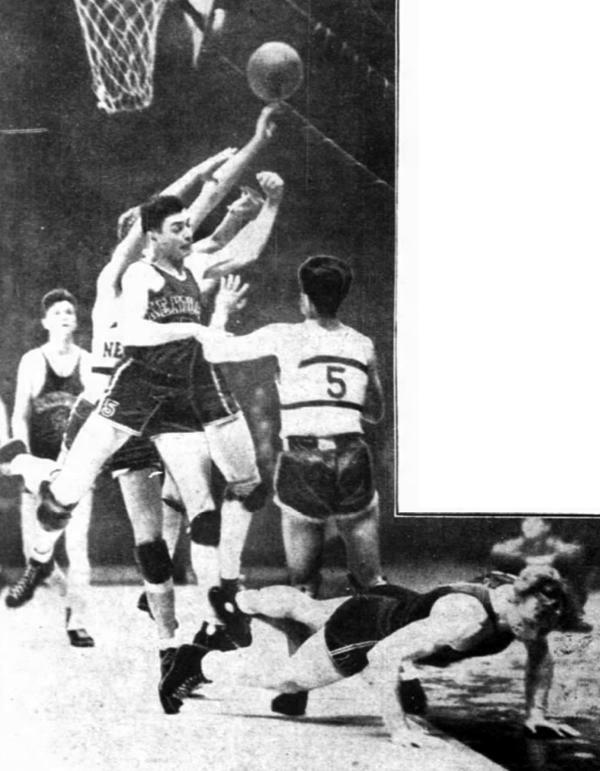 NYU's Irwin Klein grabs for the ball while Ralph Carlisle (#5) looks on.